Writing in the upper elementary grades becomes a challenge as the expectations increase. Some students really have a tough time following through with each step of the writing process. 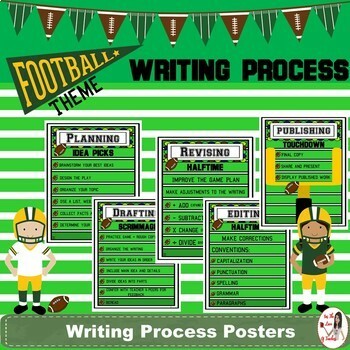 This football theme makes it more fun and increases student engagement throughout the writing process. Perfect for your reluctant writers, boys, a game based classroom or just for FUN!!! •Teacher Conferring Log- In each box record the date & name of student with a short blurb of what each student will work on after the conference. Ex. Suzy will revise her writing & focus on organization. Juan will add more details that shows, not tells. 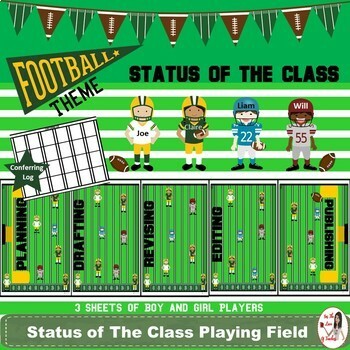 •Status of the Class Horizontal Playing Field Banner - allows teachers to know the status of each student’s progress at any given point of time in the writing process. Includes the 5 stages of the writing process. *Laminate Status of The Class banner horizontally beginning at planning, drafting, revising, editing & publishing. 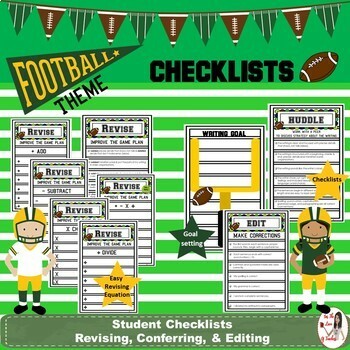 Each student gets a football “player.” Put students’ names or initials on players and laminate the sheet of players. Students each get a player and place it where they are in the writing process on the field. Putty or Velcro squares work well once the field and players are laminated. 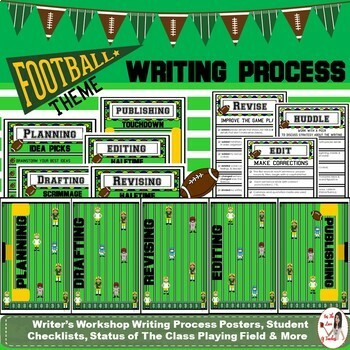 Students move their players across the field throughout the writing process until they get to the publishing/end goal. This is a great visual for teachers to see a quick snapshot of where all students are in the writing process. Visit For The Love of Teachers for teacher collaboration, professional growth and for tips and tricks from the blog. Purchasing this product grants permission for use by one teacher in his or her own classroom. If you intend to share with others, please purchase an additional license for the desired product.